The 2017 China B-League, C-League and women's B-League competitions are well underway in Quzhou, Zhejiang Province (not far from Ke Jie's hometown Lishui). 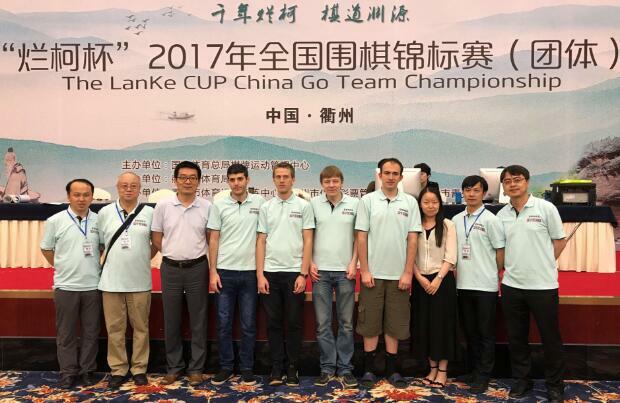 The official title is The LanKe Cup China Go Team Championship. This year there are 16 teams in B-League, 26 teams in C-League, and 24 teams in women's B-League. The BL will play 8 rounds, CL and WBL will play 7 rounds. After the competition top two teams in BL, WBL will be promoted to AL and WAL. Top three teams in CL will be promoted to BL, while bottom 3 BL will be demoted to CL. This year we actually have an all European team playing in C-League! I do not recall any European player ever played in CL before, not to mention a whole team! So I thought it would be interesting to track their progress. Also the Japanese team won the CL last year and are playing in BL now. We will see where they will finish in the BL. And there are three Taiwan teams playing in CL and WBL. Technically they are still Chinese teams but I will mention their results from time to time. Last edited by wolfking on Thu Jun 08, 2017 2:50 pm, edited 1 time in total. The playing order was determined at the time of registration and cannot be changed midway through the tournament. For Chinese teams, the ordering of 1 to 4 also need to follow one of the two rules: either go by the official Chinese Weiqi Association ranking points(from high to low), or go by their ranking from high dan to low dan. But foreign teams do not have to follow these rules. The official name of the European team is Team Tshinghua Zijing, likely because they are sponsored by Tsinghua University (Gu Li is a graduate student there). Zijing or Chinese redbud is the school flower of Tsinghua. One of the team managers is professor You Xiaochuan, an AI expert who has frequently appeared in Chinese media commenting on AlphaGo. Li Ting 2p is one of the two coaches. So this is basically last year's team with Ichiriki Ryo replaced by Shibano Toramaru, because the former is now playing for Team Chongqing in A-League alongside Gu Li. Last year after winning the CL team manager Ko Reibun talked about getting Iyama to play in the BL. Obviously that did not happen. Taiwan has Team Zhonghuan and Team Haifeng Qiyuan playing in the CL, and Haifeng Qiyuan also has a women's team playing in WBL. The competitions in the BL and CL are very strong. Just think back last year when Lee Sedol was playing in BL. So it will not be easy if team Japan wants to get to top two spots and win a trip to the AL. Edit: The two Taiwan teams are playing in C-League not B-League. Last edited by wolfking on Thu Jun 08, 2017 3:05 pm, edited 2 times in total. Results from round 1, played on June 8th. Team Europe lost to Team MLily 0:4. 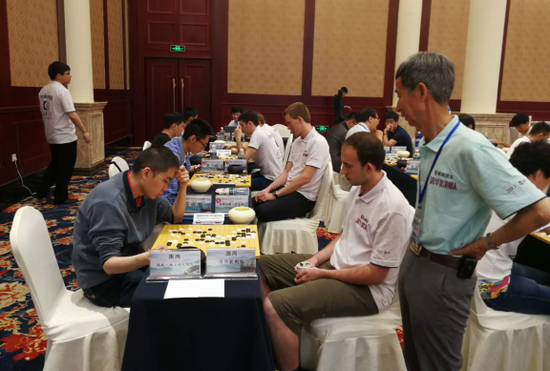 Although Ji Xiang is somehow reported here as 4D, he is actually a very strong amateur and has won high level amateur competitions (he just beat the 3 time and the reigning World Amateur Champion Bai Baoxiang on May 21 in the Guofan Cup this year). I think the 4D is a mistake and he should be registered at least as 6D. He failed pro exam last year but should still be considered as close to new pro level. Team Japan tied with team China Mobile Shanghai 2:2. Shanghai's last two positions are held by new pros from last year. Lee Yeongkyu is ranked 28th on Remi's Goratings.org so no surprise there. Meanwhile in CL Taiwan's Haifeng Qiyuan won 3:1 against HeiLongJiang, Taiwan Zhonghuan lost 0:4 against a strong Shanghai Jianqiao team led by Qiu Jun 9p. Haifeng's women's team tied 1:1 against Hebei Xin'ao led by none other than Choi Jeong 6p, the no 1 woman player according to goratings.org. Results from round 2, played on June 9th. 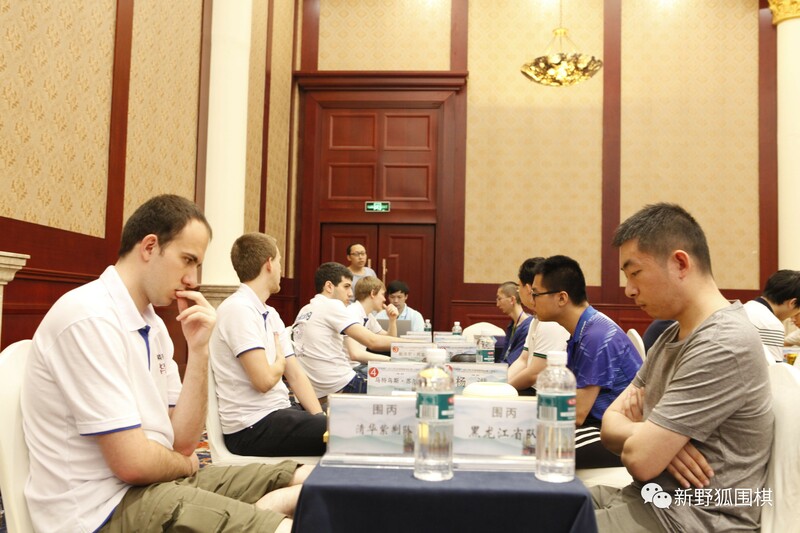 Team Europe lost to Peking University + Beijing Go School 1:3. Surma beat Zhang Chenglong 5D for the first win by the European Team. Team Japan tied with Lhasa Go School 2:2. Hsu Chiayuan has won two in a row. Ida will probably lose a lot at the first position going against strongest competition. His opponent Na Hyun ranked 34th on Goratings.org. For the Taiwan teams, Haifeng Qiyuan tied Jiangxi Go School, Zhonghuan got to play HeiLongJiang this time and beat them with the same 3:1 score, just like Haifeng did in last round. Haifeng's women's team lost to my hometown team Hangzhou Xiaoshan 0:2. Black opened with the AlphaGo 2-space jump in lower right corner. Seems to me after white invasion of black's top right corner the game became difficult for black. Maybe stronger members here can shed more light on this game. Last edited by wolfking on Fri Jun 09, 2017 12:36 pm, edited 1 time in total. Results from round 3, played on June 11th. Team Europe tied Guizhou Yiyuan Go Club 2:2! Surma won two in a row! But you could say Shikshin's win agasinst Shi Yulai is even more impressive! 15 year old Shi is a well known child prodigy and new pro from last year. It was said that he finished Hatsuyoron at age of 7 and was 9D on Tygem at 8. Many believed he would make pro as early as 2014. This and Surma's two wins should give the European team a big boost of confidence. Team Japan tied with Hulu Island Go Club 2:2. Hsu Chiayuan kept winning. Ida lost again. For the Taiwan teams, Haifeng Qiyuan lost to Xinjiang Aosheng 0:4, Zhonghuan tied Hangzhou Go Association. Haifeng's women's team got their first win against a weak Henan team consists of two amateur 5Ds. Thanks for the reports wolfking, I'm really pleased to see the Europeans getting some wins. P.S. I presume Hu Aohua who played Shibano is the same as came 2nd in the 2015 WAGC in Bangkok. It appears black had a disastrous opening, but white mishandled the invasion at lower left corner and died without much compensation. At the end it was black ahead on board by about 10 points. Yes that was same Hu Aohua who finished 2nd in the 2015 WAGC. He won the Evening Post Cup (a long standing and arguably the most prestigious amateur championship in China) and maybe that is how he got the nod to represent China in WAGC. As a tradition the Evening Post Cup champion can apply to turn pro if he is under 25 (AFAIK the only other amateur championship with this privilege is the Chen Yi Cup). Hu Aohua was born in 1999 so I think he turned pro after the WAGC. A interesting game where Ida opened with two AlphaGo 2-space jump in the corners. There was a big ko fight ended with a huge trade and I think white was ahead at that point. There was a lot of fighting after that but white maintained the lead and black resigned after all white groups lived. Are these games not included in goratings? I don't see any recent updates in Mateusz's profile. Thank you wolfking, it is very interesting news and you provide a unique source. As goratings.org states: "data kindly provided by go4go.net." I guess it's show me the sgf or the game didn't happen. I think the reason is exactly like Vesa said, goratings.org only takes into account games with record and collected by go4go.net. Most of these BL and CL games are not recorded (at least in photos above we do not see any game recorders at each table) so go4go.net will not have sgf files. You are welcome Vesa. I am happy that people are interested in what I write. I think it is great news that the European pros are doing well in the C-League. This bodes well for the future of Go. In fact in an interview after beating Shi Yulai Shikshin said that he hopes Europeans can compete in 10 to 15 years in international tournaments (the question was how long would it take for European pros to get to final 4 of international tournaments). Results from round 4, played on June 12th. Another tie by Team Europe! This time against the same HeiLongJiang team that played the two Taiwan teams in the first two rounds. Last rounds 2:2 tie must be inspiring for the whole team! Surma has won three in a row! Lisy finally gets a win and it is against Li Xiang who is ranked in the top 200 in the latest CWA official ranking (Shi Yulai, the child prodigy and Shikshin's opponent last round, is ranked 238)! Now we just need Ali Jabarin to get his win. Team Japan did not do well against Hebei Xin'ao and lost 0:4. For the Taiwan teams, Haifeng Qiyuan won 3:1 vs Team MLily, Zhonghuan tied Tianjing University Chenrui Dojo. Haifeng's women's team lost to Chengdu Go Institue 0:2. Edit: misspelled Chengdu(成都). Should be Chengdu not Chendu. Last edited by wolfking on Mon Jun 12, 2017 12:14 pm, edited 1 time in total. This photo should look familiar as it's same angle of the one I posted in round 2, but with a twist: The gentleman looking over Surma's shoulder is none other than Wang Runan 8p, chair of CWA, aka the top boss of Chinese Go. If he looks familiar, that's because he is practically in every opening ceremony for every big tournament held in China and sometimes abroad. A bit background of how the European Pro team got into the C-League. We all know the European Pro System was the product of cooperation between a Beijing company called CEGO and the EGF. Turns out the main members of CEGO were from the Tsinghua Go Foundation. So naturally the European Pro System has deep ties with Tsinghua, a university that has a rich Go culture (remember Gu Li is a graduate student at Tsinghua). 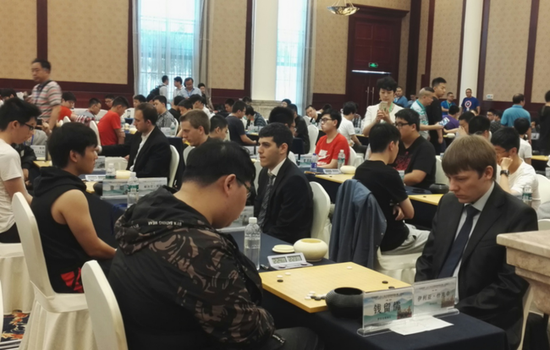 This year Tshinghua Go Culture Exchange and Research Foundation helped to organize the European Pro team, provided managers and coaches, and got a special sanction from China Qiyuan (中国棋院), the Administration that oversees all things related to board games including Go, Chess, Bridge etc., to participated in the C-League. Tshinghua's Zijing Fund became the title sponsor. They also recruited some local help from Quzhou, Zhejiang Province. Quzhou's Huakong Pharmaceutical agreed to provide some financial support. The result is that each Euro pro will get playing fees regardless of results, plus win bonus, consecutive win bonus, winning round bonus, positional performance bonus, and promotion bonus (I suppose that is bonus for promotion to B-League which is a tall order). No wonder they are play the best Go of their life! Zijing Fund board chair Shen Zhengning said that the Fund will sponsor the European Pro team at least two more years. So we should be able to see this team for another two years at least. Great posts Wolfking! Thanks and please continue to keep us informed. I don't have much context for this event, but I would imagine that this type of activity will do well to raise the level of European go, overall. Collaboration between China and Korea helped raise the level of go in those countries in the past, and I imagine that this would do the same for Western go.